OptionsHouse, which was voted as #1 in trade experience and #1 for options traders in the 2009 Barron’s Online Broker Survey, is one of the hottest new brokers on the scene. We reviewed OptionsHouse to see if it lived up to all the hype. OptionsHouse was founded by PEAK6 Investments, LP in 2005. Developed and powered with PEAK6 technology, OptionsHouse makes it possible for retail and institutional options traders and investors to graduate from basic trading to a more professional level. OptionsHouse utilizes tools and methods derived from PEAK6’s extensive trading platforms; the same state-of-the-art technology used to trade large-scale positions on every U.S. exchange, every single trading day. 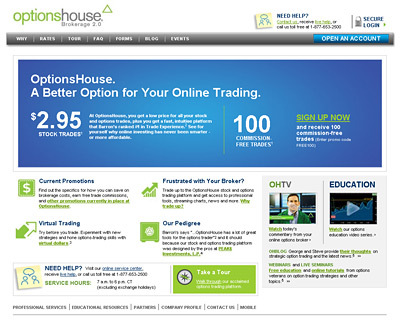 OptionsHouse stock trades are a simple flat rate of $2.95! to buy stocks. This is the cheapest rate among active discount stocks brokers online. Zecco offers $0 stock trades, but you must maintain a balance of over $25k to be eligible. Ouch! If you’re looking for stock recommendations for Optionshouse, then read my Penny Stock Prophet review. The flat rate options fee is an incredible feature since normally options traders pay by the contract. For example, if you buy 10 contracts with TradeKing, you are forking over $4.95 + $0.65 per contract. Buy just 10 contracts and this adds up. Two thumbs up for OptionsHouse and their better than reasonable fees. 1. Click here to Open Your OptionsHouse Account. 2. Enter the code FREE100 when prompted for an “Optionshouse Promo Code” during the account opening process. This offer is open to anyone who opens an account and deposits funds of at least $3,000. You have 60 days to make use of the free commissions offer. After that, you will revert to paying standard commissions.